In searching for a simple cake, which used olive oil rather than butter, I stumbled upon Maialino’s straightforward rendition. Maialino is a gem of restaurant located in New York’s Gramercy Park area and part of Danny Meyer’s famed restaurant group; I think we will all agree that anything this man is involved with is worth visiting, starting with the Union Square Café. Maialino, features the essence of rustic Roman food including everything from Cacio e Pepe to Porchetta. No surprise since the English translation for Maialino is piglet. Well, olive oil alone was not going to do it for me; I was searching for something that was nondairy to satisfy my dietary conscious daughter, La Levitt, as well as friends observing kashrut (which prohibits the mixing of meat and milk at a meal). Substituting almond milk for whole milk reflected my Calabrian roots, while increasing the amount of grated orange rind balanced the flavor nicely. 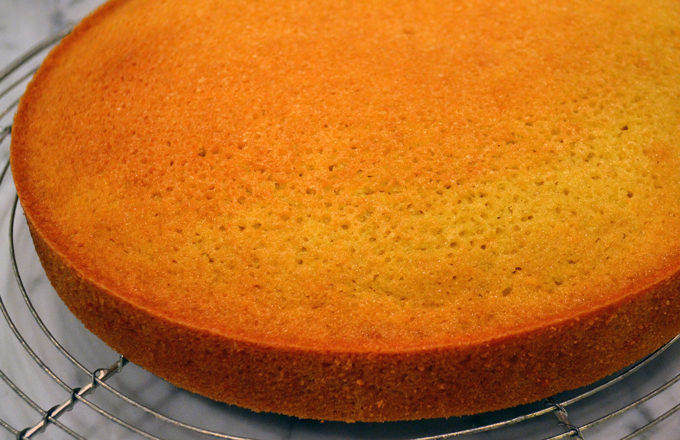 Preheat the oven to 350º F. Oil a 9 or 10 inch by 2 inch cake pan and line the bottom with a disc of parchment. Whisk the flour, sugar, salt, baking soda and baking powder together in a bowl, taking care that everything is evenly combined. 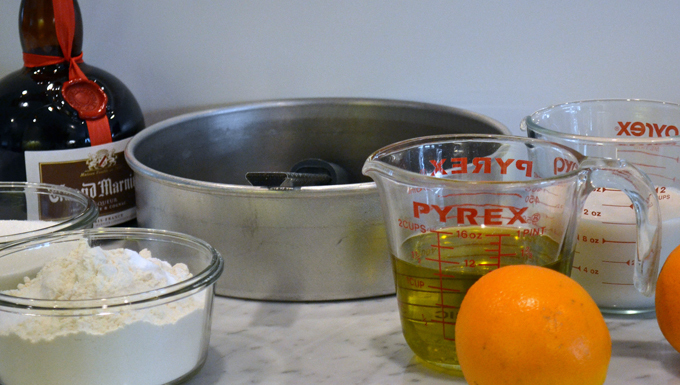 In a second bowl larger bowl, whisk the extra virgin olive oil, almond milk, eggs, orange rind, orange juice and Grand Marnier. Add the dry ingredients and whisk until free of any lumps and combined; do not over mix. Pour the batter into the prepared pan, tap pan lightly on the counter to remove any air bubbles and bake for 1 hour or until the top is golden and a tester comes out clean. Transfer the cake to a rack and allow to cool for 30 minutes. Run a knife around the edge of the cake, invert onto the rack and cool completely. 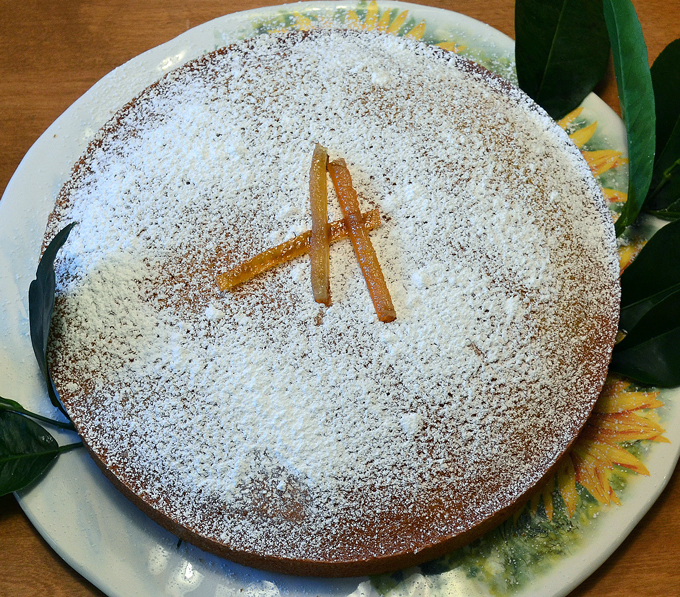 Once cool, place the cake on a serving plate, dust with powdered sugar and garnish with the candied orange peel. Paula, you are amazing! This cake is perfectly delicious, everyone LOVED it!!!!! xoxoxoxo…. Thank you Susan, I am so glad. It complimented an amazing holiday meal. This sounds excellent. I have filed this away in my list of things to make this winter when I have fresh oranges. I think you will enjoy it Steve, it is moist, flavorful, and pairs nicely with most meals.